Your course certificate demonstrated your knowledge in a specific area of studies. Our members have benefited from them for finding a new jobs, clients and applying for universities. They are a great way to secure a credential from Build Academy that will help you advance in your professional career. Our diploma programs are a way for you to show more in depth knowledge in your field of studies. Each program consists of multiple courses and final assessment by faculty from Build Academy and our partners. Diplomas demonstrate more knowledge and skills in specific areas, so they can be help you advance in your professional career. 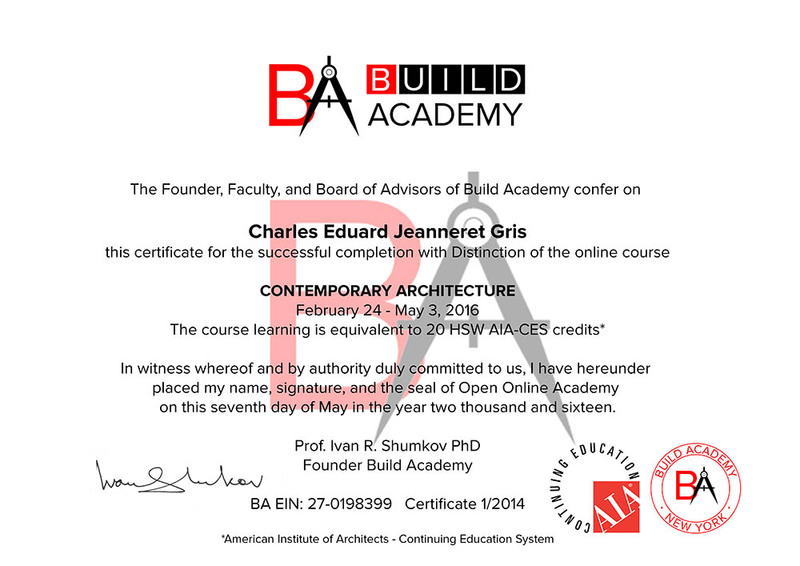 What are the differences between the AIA-CEU and Basic certificates? The AIA-CEU certificates come with LU/HSW credits for continuing education from the American Institute of Architects and international CEUs. The basic certificate proves your course completion, but does not award credits. Can I still get my certificate if I completed a course in the past? Yes, you just need to join as a Plus, Pro or Premium member and send us a message about the course you completed with us. How can I connect with the course professors and challenge leaders? You can attend the virtual meetings hosted by our faculty to speak with them in real time. You can also send us a message with your specific questions and we’ll connect you. How do I connect with other members of the community? You can join the opened groups for each of our courses and have a conversation with other members. You can also send us an email about your specific interests and we can make introductions to members who would also like to connect with you. Can I cancel my membership in the future? Yes, you just need to send us an email at support@buildacademy.com, but we would be sad to see you go. Who can I contact if I have any technical issues with the platform? You can send us an email at support@buildacademy.com and we’ll be happy to help you.